Iranian space officials announced Monday (Jan. 28) that they have successfully launched a live monkey into space, inching closer to the Islamic republic's goal of a manned mission, according to news reports. The space capsule, called Pishgam, which means "pioneer" in Farsi, reportedly returned the monkey alive after a suborbital flight to space and back, according to Iranian news agencies. 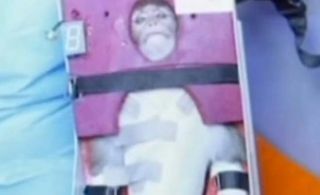 "The Islamic Republic of Iran has sent a monkey into space aboard an indigenous bio-capsule as a prelude to sending humans into space," the the Islamic Republic News Agency reported. Space officials in the country have previously said that they hope to send a human into space by 2020 and put an astronaut on the moon by 2025. Iran's defense minister, Ahmad Vahidi, told state TV that the success "paves the way for other moves," according to Agence-France Presse. "The monkey which was sent in this launch landed safely and alive and this is a big step for our experts and scientists," Vahidi said. Iran failed in a 2011 effort to launch a live monkey into space. News reports out of the country at the time did not explain what went wrong, but the plan had been to send a rhesus monkey into orbit atop a Kavoshgar-5 rocket. Iran has made progress in spaceflight technology in recent years. The country sent its first domestically built satellite into space in February 2009 and launched a Kavoshagar-3 rocket in 2010 that delivered a rat, two turtles and a worm into space. Iran also sent Earth-observing satellites into orbit in 2011 and 2012. Western critics have expressed concern over the potential military applications of Iran's rocket program, since boosters developed to reach space could also be used as long-range ballistic missiles. The Islamic republic has denied such ambitions for its space program. In the early days of spaceflight for the United States and the Soviet Union, animals were used to test the safety and feasibility of launching a living being into space and bringing it back unharmed. A rhesus monkey named Albert I was the first monkey astronaut. He was launched aboard a U.S. military V-2 rocket from White Sands, New Mexico, in June 1948, but suffocated and died during the flight. A monkey named Yorick was the first monkey to live through a spaceflight. Yorick and 11 mice were recovered after an Aerobee missile flight of 236,000 feet from Holloman Air Force Base, New Mexico, in September 1951.